Our Overnight Toroweap Photography Tours allow photographers, couples, and families to optimize their wilderness travel adventure at the Remote North Rim Grand Canyon Viewpoint. On our day tours we often hear, “I don’t want to leave!”. Problem Solved. Our Overnight Toroweap Photography Tours are exclusive, unique Dreamland Safari Tours. While this tour is often offered on a custom basis to larger groups, we also schedule several standing dates so that couples and singles can take advantage of this Private Grand Canyon Tour. -Optimal Photographic timing to capture Sunset, Sunrise, and some of the Best Night Skies in the continental United States. -Excellent Home-cooked Meals for Dinner and Breakfast. No lunches included. -Comfortable Camp Environment with Toilet, Tables, Chairs, Tents, Air Mattresses, Sleeping Bags, and Down Comforters when cold. -Safe, Comfortable 4×4 Transportation on 62 miles of rough dirt road.Rides to and from the campsite to the Rim viewpoints can be arranged upon request and with limited availability due to logistical considerations. -Wilderness First Responder Guide and Satellite Messenger in Case of Emergency. To read more about our Toroweap Tours from a Safari Guide’s Perspective, check out our Tour Guide Blog. The Overnight Toroweap Photography Tours currently scheduled are listed below. Sometimes dates are added, deleted, or shifted so check back from time to time. If you wish to book this tour click the “Book Now” Button below to get started with online booking or give us a call at 435-644-5506. Please also give us a call if you do not see your desired dates below. Overnight season is April-Oct.
25hrs: 12pm to 1pm. Adults $350, Children 15 or under $225. This tour is more for smaller groups. If you want to schedule a tour for a larger party or have more than one child, consider a flat rate custom multi-day outdoor adventure on the date of your choice. Uneven footing and large rocks are the difficulties at Toroweap. Hiking Distance is at guest discretion. 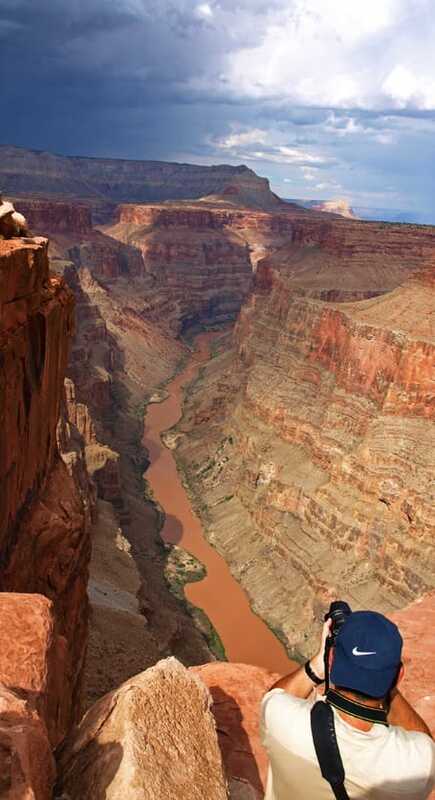 There is lots of free time to explore the rim on this wilderness travel adventure tour. SPECIAL PERMITS ARE NOT NECESSARY FOR THE OVERNIGHT TOROWEAP PHOTOGRAPHY TOURS. Camping Reservations through the backcountry permit office ARE included in the price and obtained by us well in advance. PLEASE NOTE: Because of new government requirements we are required to collect contact information for every individual in your group. Please be prepared to submit every participant’s Full Name, Address, Email, and Phone Number. The NPS may also contact any of these people to ensure that they are “verified clients”. We know this is a hassle and are not happy about it either, but we have to comply. Thanks and we apologize or the inconvenience. Click ahead if you are looking for a Toroweap Daytour. Whether you are interested in an overnighter, a week-long camping tour, or something in-between, our goal is to offer more value, more service, more nature, and more experience to you. Don’t get caught in the tourist traps! Demand more for your money. We are certain that if our average customer tried to replicate our camping tours on their own, they would find it not only more expensive, laborious, frustrating, unsafe, and time consuming, but also less interesting, involved, and informative. Don’t waste your vacation! Let Dreamland make it easy for you with our all-inclusive Multi-day Outdoor Adventure Tours throughout the Colorado Plateau and Mojave Desert. Nobody offers the level of backcountry service we do. All of our scheduled multi-day tours can be run on custom dates given availability. Give us a call or email. Booking for custom multi-day tours/dates is not available online. Please call 435-644-5506. Where the pavement ends, the fun begins!